Does my data look good in this? 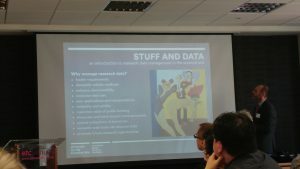 A few weeks ago, UCA organised a workshop for all those interested in research data management in the creative arts. Amy Robinson reports back with a few takeaways and some useful links. 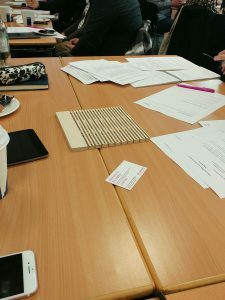 Booked up within a flash and oversubscribed, the Jisc-funded workshop, ‘Does my data look good in this?’, gathered 50 people to explore the nature of ‘research data’ in the creative arts, its importance, and what is needed for its curation and preservation to be effective. Run by the Centre for Digital Scholarship at the University for the Creative Arts, the workshop gave a unique opportunity to meet and share experiences with others who are working to support arts researchers with data management. The presentations, workshop activities and resources from the day can all be found online in the virtual good bag. Starting out, participants had varying levels of understanding of creative arts data, but by the end of the workshop 92% said this had improved or greatly improved. One participant has subsequently been inspired by the workshop to ‘kultur-ise’ their EPrints repository using the Kultur project plugin, and participants from two universities have been in contact with UCA about making use of our VADS4R data management training materials, specifically our examples of good and bad data management plans in the arts. In their feedback, several attendees commented that it would be valuable to hold another event in say a year’s time to update on progress. Want to know more? Join the Kultur list! Please join this list if you would like to like to ask questions and share practice and advice in this specialised area! Check out this storify from the event. About the author: Amy Robinson has been working at UCA for over ten years specialising in digital curation. She manages the national VADS image collection for art and design, and the University’s Open Access research repository UCA Research Online, and has project managed a number of externally-funded projects relating to the creation, use, and management of digital assets in the visual arts, with a combined project funding of £370,000. Posted by Daniela Duca on 06/02/2017 in Research at Risk, research data spring and tagged art, creative arts, research data, research data in arts.